Since I’ve pretty much been laid up for the last three weeks, I unfortunately didn’t have the energy to do any of my holiday baking that I love to do which has been a huge bummer for me. But this morning, I finally felt well enough to try my hand at a recipe I spotted on tastespotting. It’s actually a recipe that is adapted by Fanny from a Nigella Lawson recipe. I baked the cakes per Fanny’s recipe from the link above, with one change. Since we don’t have true double cream (the kind you find in the UK) here in the U.S. I did a little digging and found this recipe from Emily Luchetti at the Washington Post. I made a batch of this, and substituted it for the double cream called for in the cake recipe. Well, I think it came out delicious! I had a ton of the fake double cream left over, so I decided to get a little creative. The result is the tiny little cake above! I cut the loaf cake in half (it’s not very high to begin with, but very dense) mmmmm! Then I cut out little circles with some bisquit cutters. I layered the chocolate cake with the cream, and then topped it with a dusting of cocoa powder, some melted bittersweet chocolate, and a pecan. 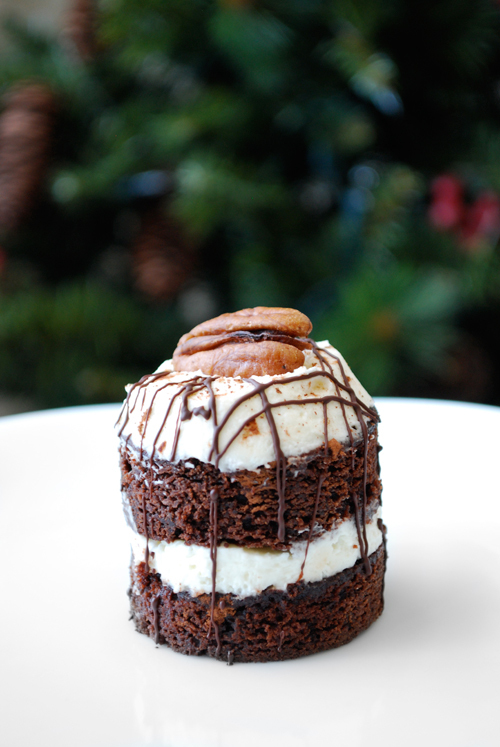 The perfect bite of chocolate cake, with a festive Christmas tree backdrop. It really doesn’t get more comforting than that. Yum. I’m amazed how professional the photo is.